3. 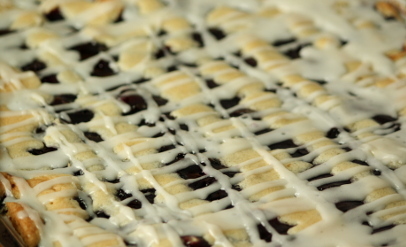 Spread 3/4 of the batter onto a greased jellyroll pan. 4. Spread pie filling over the dough. a few drops of milk (or your favorite substitute) until it is easy to spread. 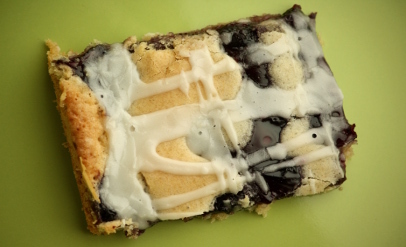 Drizzle over the dessert when it is cooled. Enjoy! 3 Responses to "Gluten Free and Dairy Free Fruit Bars"
I can speak for everyone who ate half the pan (because I was one culprit) – this is one incredible dessert. Any thoughts on halving this recipe to make in a 9×13 pan if i only have one can of pie filling on hand? Also…no real difference then b/t using crisco or butter? Thanks!!! I have halved it successfully, and it won’t matter if you use crisco or butter. Enjoy! Let me know how it goes.